The girls from [Roselia] are joining the Weiß Schwarz stage! One of the bands in the highly anticipated mobile game “BanG Dream! 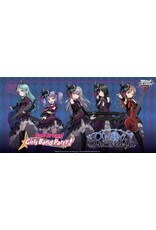 Girls Band Party!” releasing in Spring 2018, this Trial Deck+ is an entire deck devoted to [Roselia]!! Accentuating the charm of all 5 members, this Trial Deck+ is a must-have for any [Roselia] fan! 1 SP Gold Foil/Hot Stamp signed card from the following voice actress is randomly inserted in decks! !